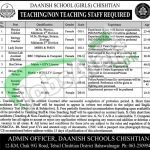 Here in the following I am going to discuss about the recent job opportunity from Daanish School Chishtian Jobs 2016 For Academic & Non-Academic Staff. For all those applicants who are natives of Punjab are well aware about the well reputed institute named which is having the sparkling names as "Daanish School" is the leading educational institute which is established by the Govt of Punjab is the largest chain of educational institute in the different districts of Punjab which offers Teaching & Non-Teaching posts from Masters Level to Matric and Middle with attractive pay package and fringe benefits also. Now, recently the applications are being offered from the Daanish School (Girls) Chishtian is recently looking to hire the energetic, caliber and well disciplined applicants as (Physics Teacher, Biology Teachers, Lady Doctor, Science Lab Assistant (Physics), Bus Driver, Driver (Car, Bolan), Security Guard & Mess Waitress/Dish Washer) are required to apply for these posts. Both genders are eligible to apply. Teaching staff will be hired on contract basis after successful completion of probation period. The candidates will be given freely partial accommodation full furnished facility with growth offers and attractive remuneration package. Now, after discussing these all details have a look on its applying criteria below. Overall eligibility criteria which is required for these posts includes MS.c, MBBS, BS.c, Ph.d/M.Phil, B.ed/M.ed, Relevant Diploma, Matric, Middle and those of with Teaching expertise are eligible to apply. Age limits are different for the above posts from one another. Applicants needs to send the CV along with the copies of experience and educational certificates, CNIC and recent passport size photograph should reach at the said address. Last date for applying is 24th December 2016. Shortlisted applicants who are applying for the Teaching Posts have to undergo through the Written Test related to the subject, IT Test & English Proficiency Test (Subjective & Objective). Late received and incomplete applications will not be treated. The recruitment will be cancelled at any stage. Both male and females are welcome cordially and equally to apply. 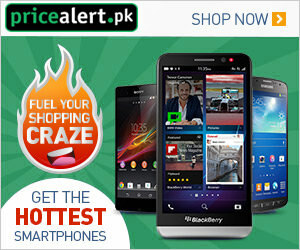 Stay in touch with us and keep visiting our site JobsAlert.pk for more jobs to choose and apply for your desired job from this page every bright morning. Address: Admin Officer, Daanish School Chishtian, 12-KM, Chak 9/G Road, Tehsil Chishtian District Bahawalnagar.